Vittoria Vici is an Imperial citizen of Solitude and the first cousin to Emperor Titus Mede II. 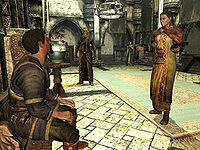 She oversees the East Empire Company's holdings in Solitude and is influential and wealthy enough to be invited to Elenwen's upper-class party at the Thalmor Embassy. She is also engaged to a Stormcloak, Asgeir Snow-Shod from Riften, and a huge wedding is in the works. Due to the couple's differing political stances, the wedding is considered a precursor to end the civil war and is expected and celebrated by many. Unfortunately, the wedding has also attracted the attention of the Dark Brotherhood who deems it the perfect opportunity to regain their reputation. Vittoria lives in one of the exclusive mansions in Solitude, neighboring Proudspire Manor, and she sleeps there every night between midnight and 8am. After waking up she heads down to the dockside and finds her stall near the entrance to the East Empire Company Warehouse where she spends twelve hours. At 8pm she returns to her house where she wanders around until midnight. There is one major exception to this daily routine, specifically during the quest Bound Until Death. Once initiated, Vittoria Vici will be in the courtyard outside the Temple of the Divines busy being the bride of the much anticipated wedding. Her everyday attire consists of a set of fine clothes along with a pair of fine boots. She wields a steel dagger and carries the key to her house, a belted tunic, and a selection of upper-class items and gold. During her wedding, Vittoria wears a unique wedding dress, wedding sandals, wedding wreath, and her wedding band. If you meet her on the streets of Solitude she will immediately defend herself: "Some say I got my position because my cousin is the Emperor. Nonsense. The man's given me nothing. He can't even be bothered to attend my wedding." She will then tell you: "Good business for the East Empire Company means all the more gold for the Empire." She will then hint on her status: "I don't have time for anyone too lazy or cowardly to make their own way in this world." Should you approach her while she is at work, she may say: "Hmm? Sorry, I was lost in thought. I'm planning my wedding, you see. So many details to work out." Plautis: "Come along, no more stops, we need to find our way to Solitude." Salonia: "Why are we even going to a wedding at this far flung end of the Empire anyway?" Plautis: "I told you, it's the wedding of Vittoria Vici, an extremely well connected merchant with the East Empire Company. The Emperor's cousin? Remember? Hopefully these gifts will put us in her good graces, secure that import deal, and lead the way to an audience with the Emperor." The Spiced Wine: Convince Vittoria Vici to hand over some spices. "How dare you! You disgusting pig!" Vittoria: "How dare you! You disgusting pig!" Vittoria: "The head office will hear of this, Razelan! You're a disgrace to the East Empire Company, and to the Empire itself!" Razelan: "I protest! This is an insult to the dignity of my person! This time I'm completely innocent!" / "This is preposterous. Disrespect... insulting! I am tired of being hounded from all sides!" / "Madame Ambassador, you know that I would never have behaved... that is to say... well I swear I'm innocent this time!" Vittoria: "Oh, Ambassador Elenwen, that won't be necessary. It is just Razelan, after all. I'm sure he'll behave himself for the rest of the evening, won't you dear?" Razelan: "Absolutely not! I protest... uh, that is, yes, of course. I still don't understand what just... oh never mind." / "That is absolutely untrue! Uh, that is, yes, of course. What... I don't understand why everyone... never mind." 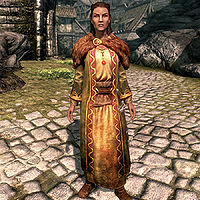 Before the wedding gets underway, pay a visit to the Solitude market and talk to local vintner Evette San to start the quest The Spiced Wine. She will admit having problems with a shipment of spices for her special wine, saying: "I've got a shipment of Spices the East Empire Company is holding up. I need someone to convince them to release it." When you accept to help her out, you will be pointed towards Vittoria Vici, who handles the shipments. When approached about Evette's problem, Vittoria will respond: "Ah yes. If she wants to pay the two thousand gold tariff than [sic] we'll be all set." Should you exit conversation, Vittoria will bid you farewell with the words: "I really need to get back to planning my wedding.." and "Now if you'll excuse me. The East Empire Company has several accounts, and it's up to me to balance them." "Sure, I'll pay the tariff." (2000 gold) "You will? I mean of course you will. 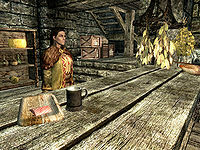 You can tell Evette San her shipment will be brought up to Solitude shortly." "Evette can't afford a tariff. She can barely afford her stand." (Persuade) Passed: "I suppose I could make an exception. I do like her spiced wine. Fine, tell Evette San her shipment will be brought up to Solitude shortly." Failed: "That's not my problem." (Bribe) Passed: "That would be acceptable. You can tell Evette San her shipment will be brought up to Solitude shortly." Failed: "I'm afraid your [sic] bargaining without the metal to back it up." "Her name is Vittoria Vici. She oversees the East Empire Company's business holdings in Solitude. The wedding is being held in that city, at the Temple of the Divines. Her death will cause an uproar, which is exactly what we want. Vici is likely to address her guests frequently, as is the wedding custom. Kill her when she does that, and I promise you a significant bonus. Now go. And give my best to the bride." Enough talk. Just tell me who to kill. "Very well. The target's name is Vittoria Vici. She oversees the East Empire Company's business holdings in Solitude. The wedding is being held in that city, at the Temple of the Divines. Her death will cause an uproar, which is exactly what we want. Remember, we want people to notice. Kill Vici while she's addressing her guests, as is the custom, and I can promise a bonus. Now go. And give the bride a special kiss, from me." "Your target's name is Vittoria Vici. She oversees the East Empire Company's business holdings in Solitude. The wedding is being held in that city, at the Temple of the Divines. Her death will cause an uproar, which is exactly what we want. Vici is likely to address her guests frequently, as is the wedding custom. Kill her when she does that, and I promise you a significant bonus. Now go. And give the city of Solitude a celebration they're not likely to forget." "And they say romance is dead." You can then ask Astrid a slew of additional questions to make the task easier, and why Vittoria has to die. First of all, she will provide more details on the contract: "This is a public kill. How you do it is entirely up to you. Arrow to the throat? Knife in the belly? Your choice, so long as it's loud and messy. 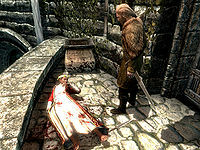 Because of the current political climate, people are going to assume the murder is related to the bad blood between the Legion and Stormcloaks. In any event, when Vici dies, it's going to be complete pandemonium. Best have your escape route planned out in advance." Astrid will also reveal that she has little interest in the ceremony itself, and wants you to hit during the public banquet. When asked when the wedding will start she will explain: "Soon. I'm not exactly sure when. But not to worry - the ceremony itself is being followed up by a public banquet that will last for several days. Both Vittoria and her husband will be there for the duration, and everyone in Solitude is invited to attend. You'll have plenty of opportunity." Last, but not least, she will explain who Vittoria is, and her relations to the Emperor: "An excellent question. Vittoria Vici is the first cousin to our dear Emperor, Titus Mede II. Vici has obvious Imperial connections. Her husband has ties to the Stormcloaks. Their union is a step toward reconciliation. So if there's a murder at the wedding... Not only will it stall the peace process - it will send shockwaves throughout the entire Empire. The Emperor's hand will be forced. He'll have to travel to Skyrim to deal with the aftermath... and he'll find the Dark Brotherhood waiting." 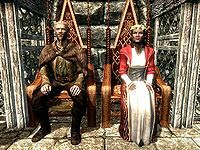 While Astrid cares little about the civil war or the casualties in its wake, she will explain why the Emperor isn't attending the wedding of his cousin: "He had a trip to Skyrim planned for months, and canceled at the last minute. Much to his cousin's dismay. Seems the Emperor realized his presence would necessitate a more direct role in the ongoing hostilities. A role he was, obviously, unwilling to take. All that will change with his cousin's murder. Everyone will think it was motivated by the conflict between the Imperial Legion and Stormcloaks. And the Emperor will be forced to come clean up the mess." "May you all be as happy in your lives as I know I will be in mine." Second line: "I just wanted to take this time to thank you all for being here. To thank you for sharing this wonderfully happy day with myself, and my new husband." "Are you all enjoying yourselves? Please, eat, drink, and make merry on this most happy of days." "My husband Aesgir and I thank you for coming to our reception. We thank you for sharing the love we have for each other." Third line: "I thank you all again for making this the best wedding a woman could ask for." "You have all helped make this a truly extraordinary wedding. All of my dreams have come true. So thank you. Thank you all." "May you all be as happy in your lives as I know I will be in mine. Thank you again for everything." "I'm... I'm just so overwhelmed. Such kindness... for me." After that, she will proceed with the wedding and will, when greeted, almost declare the civil war over: "Please, enjoy the festivities! This is a day of peace and happiness, when Imperials and Stormcloaks join together, as equals!" Her husband will constantly be by her side and will be equally joyful. If you are male, he will remark: "Now now, fella. Let's not get too close to my new bride, eh?" If you are female, he will jokingly say: "Well aren't you a pretty thing? Should my new bride by [sic] worried? He he he he." When asked if he thinks the party is good, he will respond: "The best. Vittoria's a good woman. Any man should be so lucky. I know my father's not happy about me marrying an Imperial, but that's his problem." "My wife is dead! Dead!" When Vittoria dies, the party will change from joy to horror and all of the guests, including the Penitus Oculatus agent, will start running around in panic. Guards will arrive and look for the killer, and Brotherhood member Veezara will arrive and provide unexpected help on behalf of Astrid. If approached, the widowed Asgeir Snow-Shod will be shocked and repeat: "My wife is dead! Dead! ", while all the party guests will have specific reactions to the tragic kill. Upon your arrival back to the Sanctuary, Astrid will rejoice in the deed: "Haha! The news is everywhere! Vittoria Vici, the Emperor's cousin, butchered at her own wedding! Let's see his eminence try to ignore this." When spoken to again, she will then congratulate you on your success: "With Vici's murder, you've started us down a path the Dark Brotherhood hasn't traveled in centuries. The assassination of an Emperor. And now, your reward. A unique spell to summon a legend of the Dark Brotherhood. His soul serves us now in death, as his body once did in life. This spell will allow you to summon a powerful spirit to fight by your side. He serves the Brotherhood now in death, as he once did in life." In Solitude, the wedding decorations will be gone and all the guests will have returned to their daily life, although hope for peace will be gone. None of the citizens will speak of the tragic event, although the guards will comment: "The cousin of the Emperor was murdered! In Solitude, at her own damn wedding. Not a chance we would have let that happen here. ", "I heard you were at the wedding of the Emperor's cousin. In Solitude? Gods, that must have been horrible..." and "Look, that Vici woman had a bodyguard. I know it's terrible she got murdered at her own wedding, but the city guard is hardly to blame..." Widower Asgeir will have returned to Riften and will never speak of the tragedy again, while his deceased wife will be buried in the Solitude Catacombs, still wearing her wedding dress. "My nephew, the Emperor. Too busy to attend the wedding of his beloved cousin. We won't stand for this slight, I assure you." "I most certainly am not. I've just lost my daughter to a Nord beast, and my nephew Titus is too busy playing Emperor to even show up." "My daughter! Dead! Noooooo!" "What my daughter sees in that... barbarian, I'll never know." "The thought of paying a dowry to that, that... Stormcloak turns my stomach." "A marriage of both love and political advantage. A rare thing indeed." - "The Emperor's cousin is dead! This is a disaster!" "By all the gods, the groom has been killed. At his own wedding! I can only think of my own husband..."
"This wedding is boring. I wish they had jugglers." "Not really. It's just a bunch of elders standing around, looking important. I wish something exciting would happen." "What's going on? Why would somebody do that?" "When my aunt got married, they had a cake that was three feet tall. I got really sick that day." "I heard Vittoria Vici is the Emperor's cousin. I wish he came to the wedding. I never saw a real live Emperor before." "Sorry, no time to talk. I need to keep playing." - "I never should have taken this job!" "Long as I stay out of the way, the guards don't seem to care about me being here." "Am I! Free food and wine, and nobody trying to throw me in the dungeon. I wish they did weddings here every day." "I didn't do it! You saw! I didn't do it!" "I've eaten more in the last two hours than I have in the last two weeks." "If I'm really lucky, I'll get to kiss the bride for good luck." "Vittoria may be pretty, but does she have the right hips for the job? I want grandchildren, and lots of them." "Oh. Why... why certainly. I keep telling myself I'm not losing a son, I'm gaining an Imperial. Daughter. An Imperial daughter..." "By Ysmir, this is horrible! I never wanted the girl dead, I swear!" "To think, my little boy is married. And to an Imperial. Oh, they grow up so fast." "If my Asgeir is happy, then I'm happy. Really." "If you want my opinion, I think they should have paid for an entire quartet. Plenty of bards at the College would have loved the opportunity." "I am, thank you. I do so enjoy singing at weddings. It's just one of the many duties we at the Bards College are called upon to perform." "I just came to sing! This is a horror show!" "Ahem. Mi mi mi mi. Pardon me. Just, um, warming up. Never know when I may be called upon for a ballad." "I'm just here to provide protection for his eminence's cousin. Please, enjoy yourself." - "She's dead! On my watch! This won't stand!" "I'm so glad Vittoria and Asgeir chose a public reception. That way the entire city can share in their holy bond." "Oh, yes. Presiding over the union of two lovers is one of my greatest responsibilities. It helps that Asgeir and Vittoria truly care for each other." "Oh, no no no... This is so wrong..."
"Oh, did you miss the ceremony? It was rather quick, actually. The couple seemed more concerned with their reception." "Vittoria did pretty well for herself, marrying that Asgeir. Not a bad looking fellow at all." "Oh my, yes. I absolutely love weddings. I haven't found my special someone yet, but there's still hope. Vittoria is, well, getting up in years..." "By the gods, the blood! The blood!" "I love weddings, don't you?" "I just can't wait to be a bride someday. 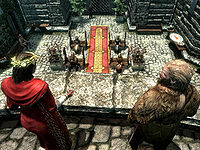 Someday..."
"I still think my boy should have had a traditional Nord wedding. Outside, in the cool mountain air." "No, I'm not having a good time. My boy just married a gods-forsaken Imperial. Skyrim is full of eager Nord women, and he beds down with the enemy." "It was the Empire killed her! I know it! They killed her so they can blame it on the Stormcloaks!" "They say this marriage is the first step towards peace. Who in Shor's name wants peace? Pfft." "My son is dead! At his own wedding! Only those Imperial dogs would have dared do something like this! Damn them all to Oblivion!" "My boy, he always did have an eye for the pretty ones. That Vittoria ain't bad, for an Imperial." Killing Vittoria before The Spiced Wine is started will make it impossible to complete. Vittoria was supposed to be involved in two conversations while working on the dockside. The first conversation, DialogueSolitudeDocksScene1, involves the three Argonian dockworkers, Deeja, Jaree-Ra, and Gulum-Ei, although all three of them can respond to Vittoria when she says: "Big shipment coming in later tonight. I need you three working late." To which one Argonian will say: "Oh, we'll make sure it's emptied out by morning. You can trust us!" and another will continue with: "Yeah, we'll get the valuables out of there, no problem!" Due to the extreme conditions of the conversation, it will practically never take place. The second conversation, DialogueSolitudeDocksScene3, involves Greta, who never goes near the docks, so her plea: "Got any work? I ain't begging. I just need a job. Anything." And Vittoria's answer: "Sorry, I have everyone I need at the warehouse. Times are tight." will never be heard. Vittoria was supposed to offer services as a general merchant when down at the docks, but she instead just stands there without the option to trade with her.